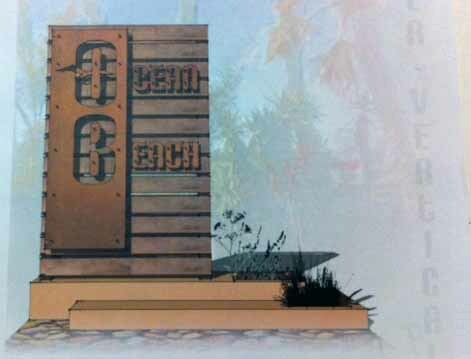 The Ocean Beach Town Council has been sponsoring a contest for a new OB Entry Way sign, with allegations that the current one is falling apart due to termites and weather, etc. 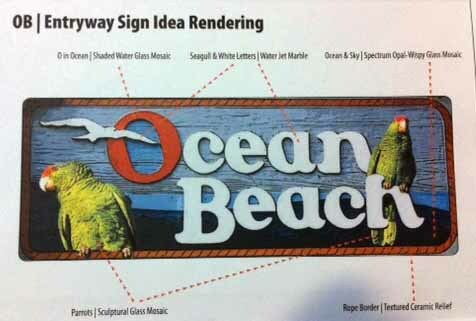 The Town Council board – a private organization – has decided on five finalists for a new sign to grace the entry way to Ocean Beach. Only Town Council members will be allowed to vote – on the sign that represents the entire community. The Council is asking folks to go to their website and then make constructive comments on their facebook page. You can also make comments here to this article, and you can vote for the finalists in our poll – started today, Jan. 24th. 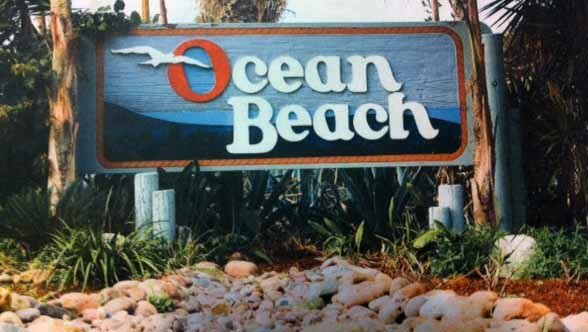 The current Ocean Beach entryway sign has been weathered by 20+ years of sea air and termite damage. We now have five finalists for the sign (including keeping the same design, but refurbishing it)! Either way, please post your constructive and respectful comments on Facebook — it is the best way to let members know your favorites! Option 1 (in no particular order): Keep the same design, but renovate the sign. The wood in the current sign has rotted and it must be replaced, but members of the Council can vote to keep the same design. 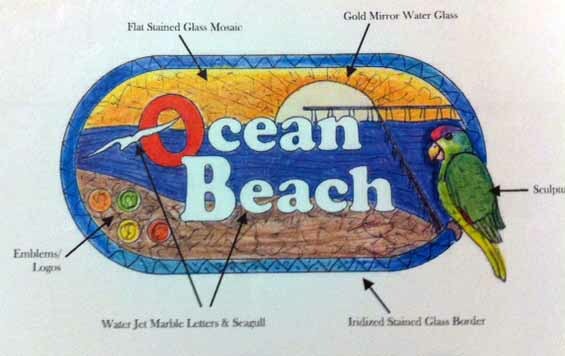 Option 2: Stained Glass with Beach and Parrot. Option 3: Current design, adding parrots. While the other designs are nice, I just really think the classic looks best. It would be strange to see a different sign there. And stained glass?? Really? That would get broken faster than you can say “gentrification.” nice design though. Hopefully those artists can be recognized in another way. But I think I’ll be voting for the classic all spruced up! Just add parrots they make everything better. The metal one looks like Dockweiler, very LA. The giant seagull one is hilarious, of the options I like it best but I think it needs some bums down by the pier to keep it real. Seeing the direction a lot of other SOCAL beaches have taken these days I’m guessing that it will be option 4 and the decision has already been made. Re: #4 design. That is true. Something Del Mar would do and it would be appropriate there. But this is Ocean Beach! O.B. should resist this design for the fact that in 20 years, the old sign will be meaningful if the community keeps its integrity: small scale cottages, small business, social low key atmosphere. The ethos of the community and the old sign are one. I would go with the original design–the gull is a native, and the parrot is an introduced species. While agree with your choice Tom, I have to point out that OB is filled with “introduced species.” it’s what we’re famous for. I like the classic sign with the translucent materials and maybe a smaller parrot in/on a corner. Let’s keep the old and compromise on the new ideas. Maybe we could add the pier in there since it is such a large fixture in OB. I like the idea of adding the pier in the background. Is the sign on city property and/or considered Robb Field? Who is paying for the sign? How much does each sign cost? Who is responsible for the upkeep of the sign? Who pays for the electricity to light the sign? Who appointed OBTC to do what they are doing in regard to the sign? while an eyebrow is raised when we first learn that only town council members will be allowed to vote on the options, to their credit they do a lot for the community, and this is a little pay-back for them, it is their contest and i’m guessing it’s their money that will be used to install the winning design, whatever it is. Eyebrows raised……..”their” money comes from people to attend OB events unless the board members are making hefty contributions to this organization. If funds are coming from the city then it’s tax payer dollars. I am doubtful that OBTC is paying for the construction, installation and design of this sign. Can anyone enlighten the OBRAG readers on where the money is coming from and how much has been allocated? If the OBTC wants to help and solicite designs that’s fine but why should a handfull (maybe 150 members) get to pick? Why not have a booth at the farmers market where people can vote? Why not have a community forum along with some other worthwhile OB issues to get feedback? There are a lot of people that do stuff for the OB community and never get a pay back. as my french friends say, ‘beau mots’. I will be voting for keeping the original sign! OPTION 3, If the parrots cn be large enough not to look too small on the sign. Maybe add the pier in hte back ground too. It’s not really different from option 1 and needs to maybe even have a larger sign. Like nearly everyone else, I like the original sign (but with the pier in the background as Susie mentioned.) Whatever design/materials are chosen, it better be heavy-duty enough and coated with something to withstand the vandalism that is sure to occur. The original sign is quite nice. Perhaps it could be replicated on stainless steel, & then apply variegated metal stains. The parrots crowd the design & do not look integrated into the original layout; they look to be an afterthought. I’m suprised these are the best five. that said the original is by far the best choice. Not too excited by adding parrots. The seagull is the original. They were eaten by the homeless. Don’t know just where the parrots are presently but it’s winter and we see (hear) fewer of them. They are around, though, just saw a small group fly over a few days ago. Wait until the weather warms up, maybe as early as February. Last year, the flocks were the largest I’ve seen/heard since the late 1990s. As for North Park, some may have emigrated from OB, especially if there was a population explosion last year. I, too, prefer the original but would love the addition of the pier, setting sun and a large parrot at the lower left as in #2. Lots more color…. just like our colorful community. As someone who was raised in OB and can remember the first really cool OB’s as they were introduced to the public. In my humble opinion, I would like to see a “BIG”, as in the 6 to7 ft. range, replica on our beloved “Green OB” from the mast head of the former underground publication known as the OB Rag. This “OB” has far more meaning than any of the other OB type logo’s. Plus it would imortalize our attitude towards the consciousness in the community. When they installed the new corner project there were these lights that blinded people as they drove around the corner. For anyone not driving a high profile vehicle it was very dangerous. I think enough people complained and they put in lower wat bulbs (or so it seemed). If the stained glass one wins PLEASE consider the direction it faces so that we don’t have even more crashes along the entryway. Do not face it into the sun.